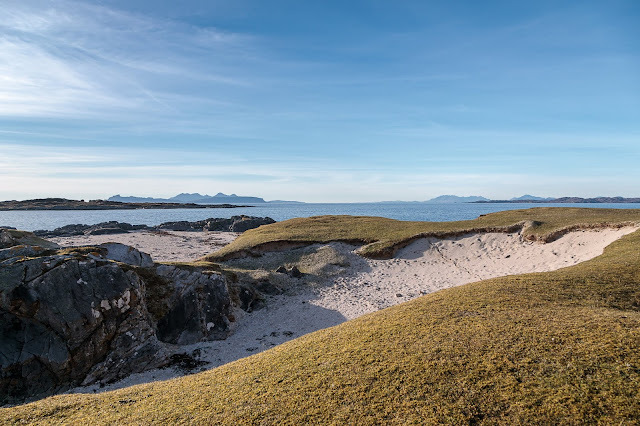 ...closely cropped machair which backs the beach. 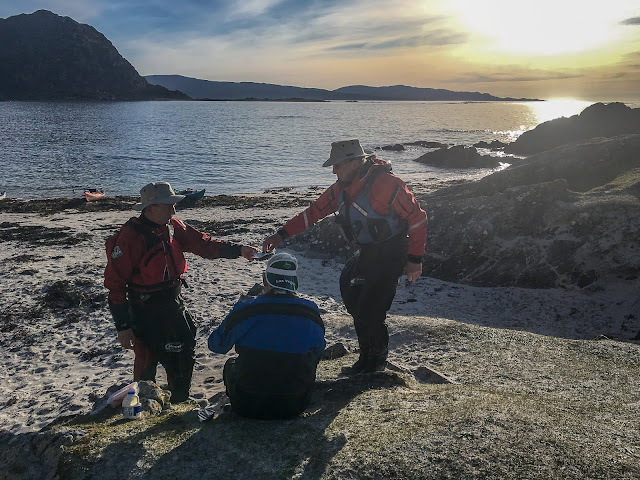 Here, below a rapidly sinking sun, we partook of our 4th luncheon which we washed down with a not ungenerous snifter of 12year old Caol Isla. ...to Rubh Arisaig and Skye to the north. ...turn to the east and enter the Sound of Arisaig. 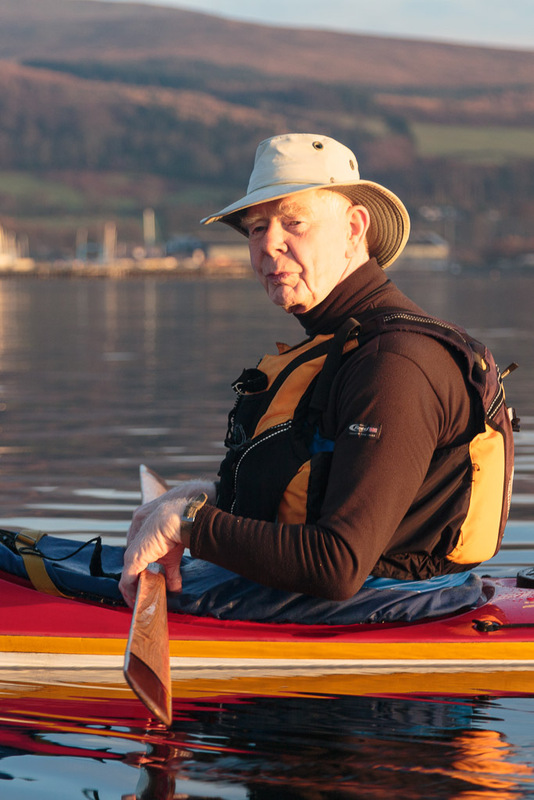 The sun was setting as we paddled on towards Glenuig Bay where we drew the boats up in the gathering darkness. 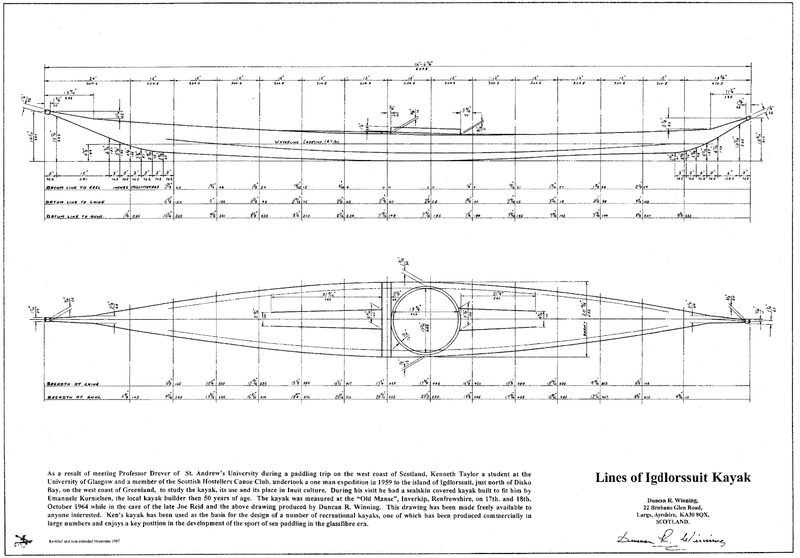 Sadly there would be no further luncheons on this day. 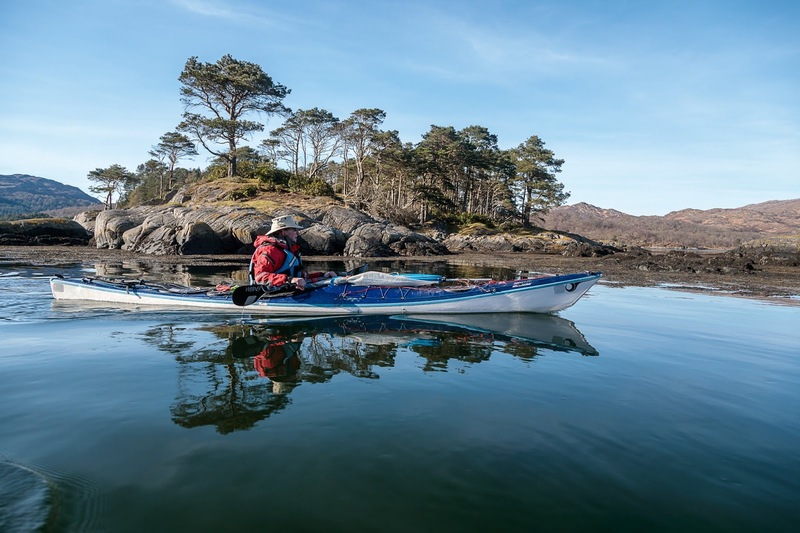 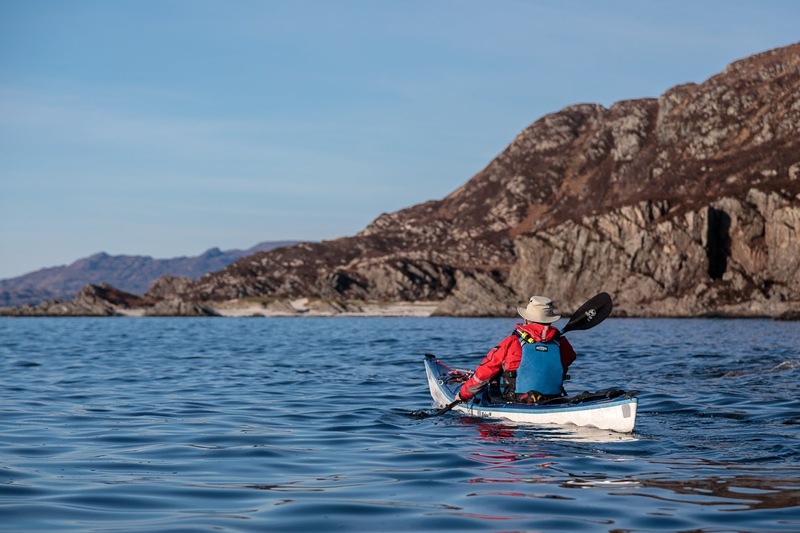 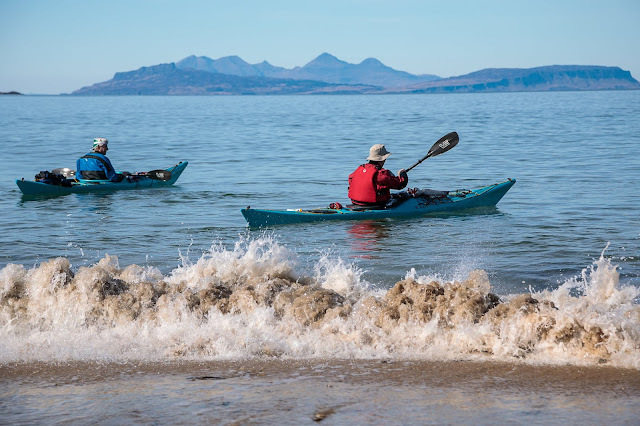 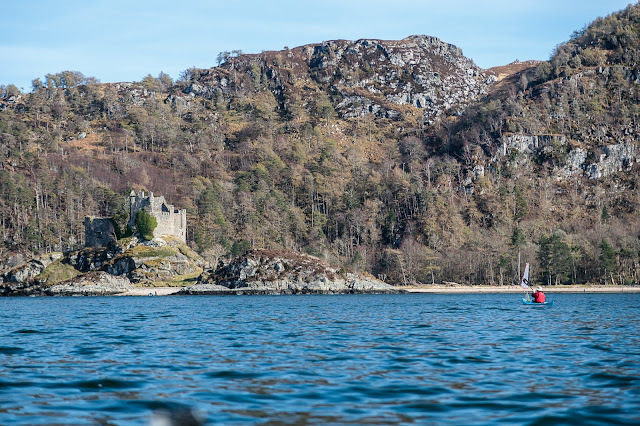 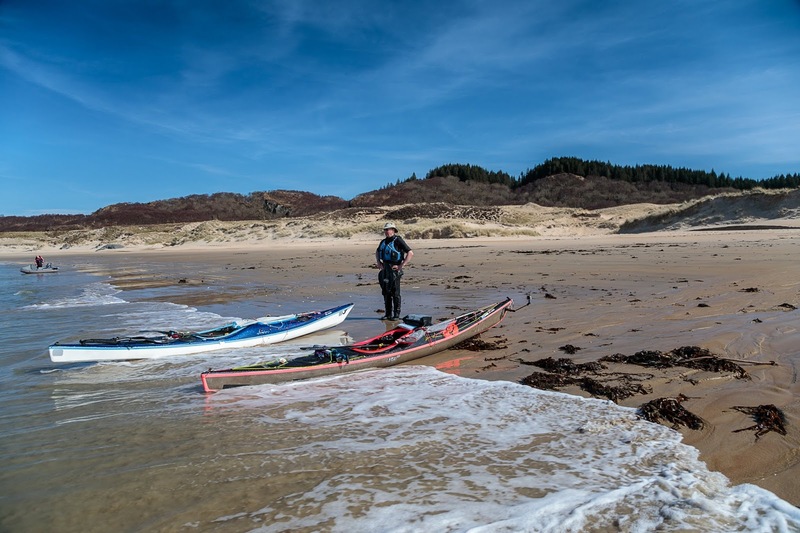 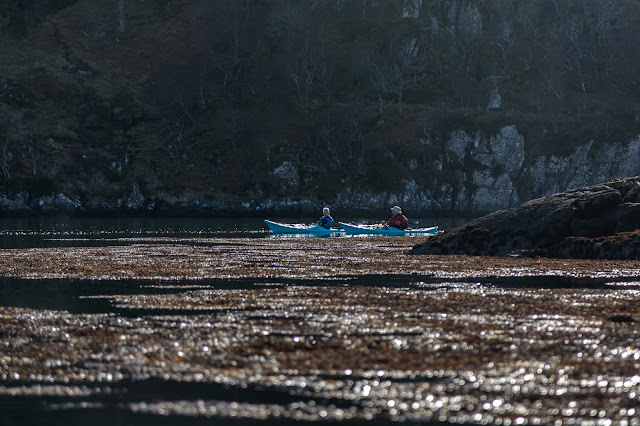 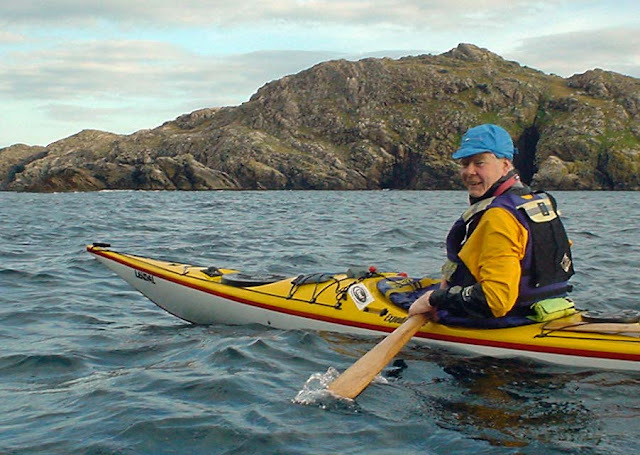 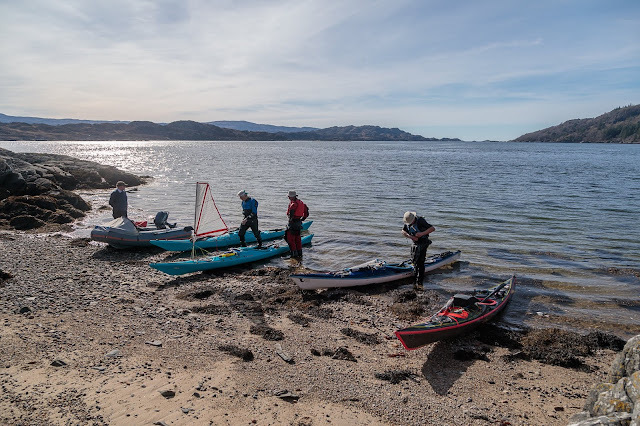 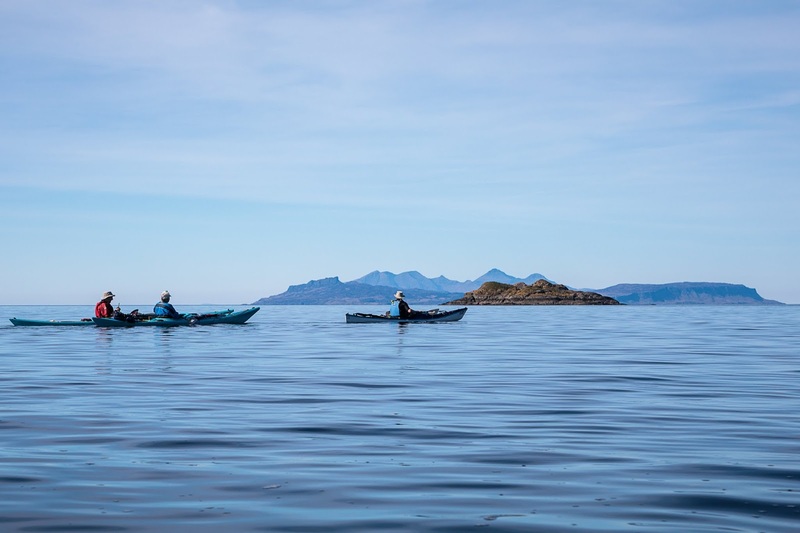 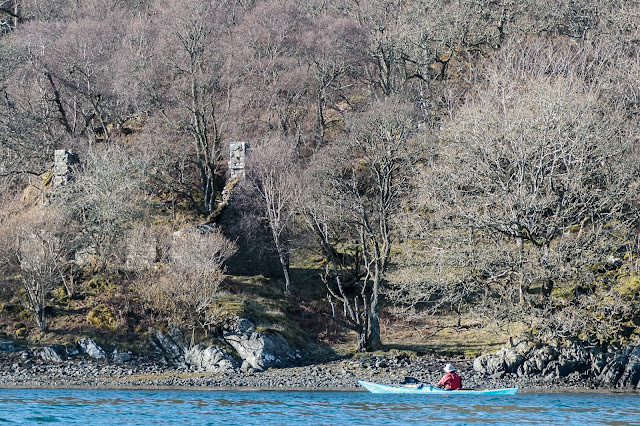 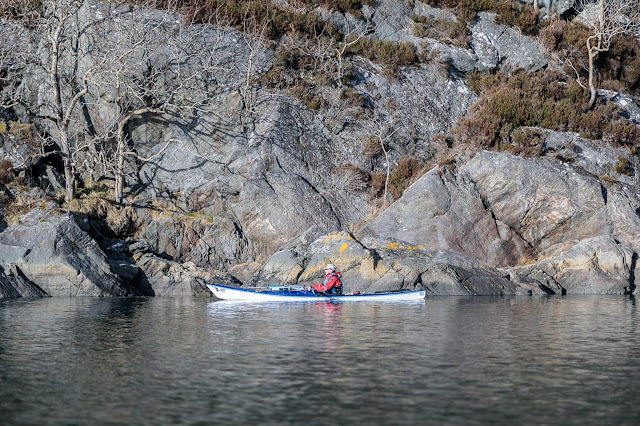 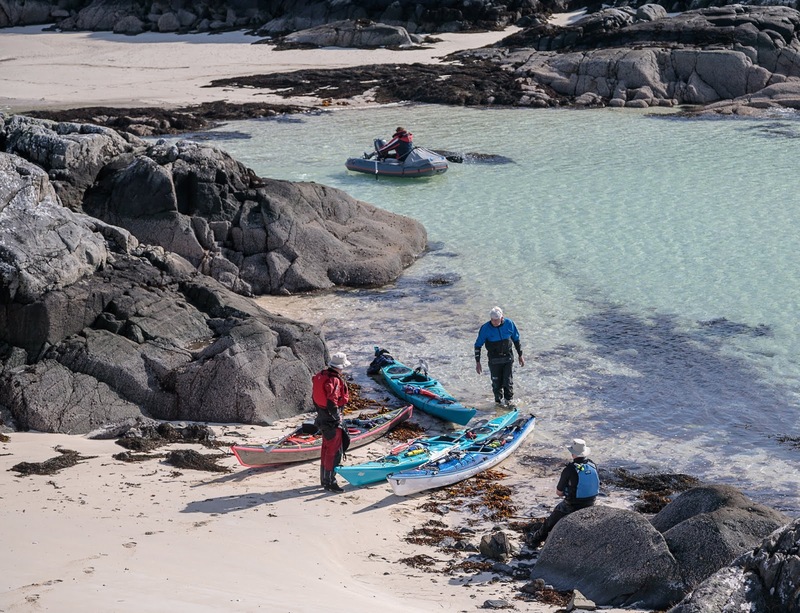 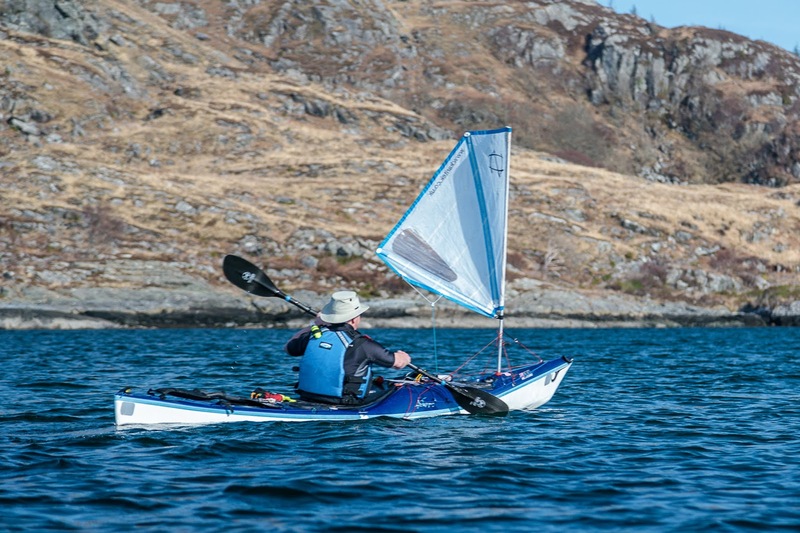 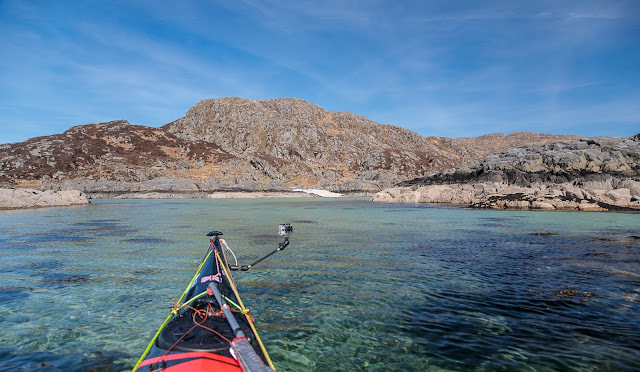 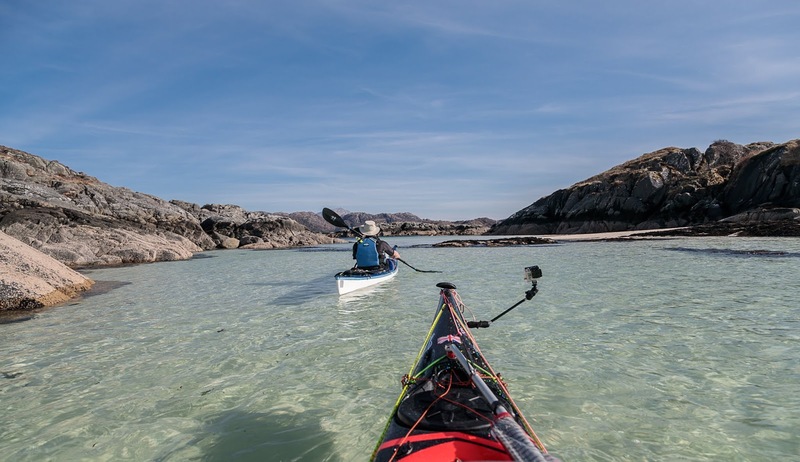 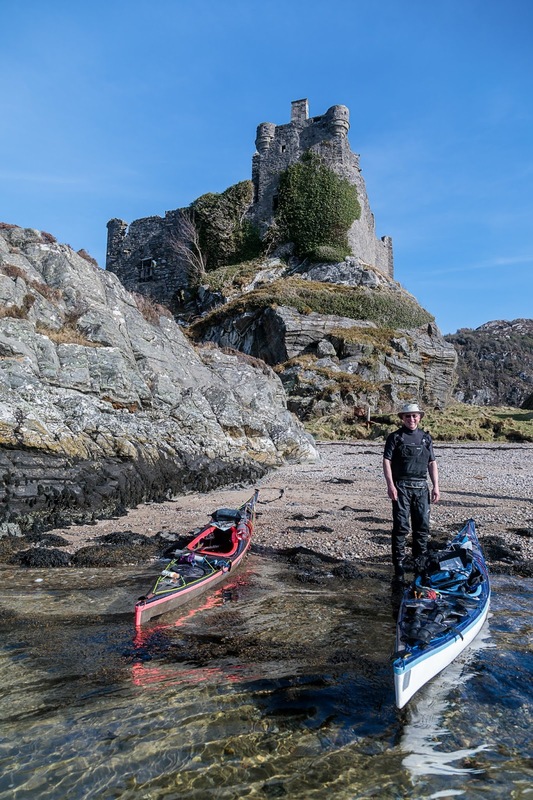 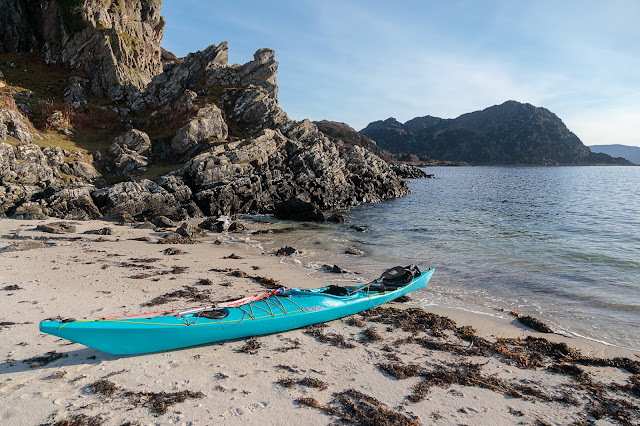 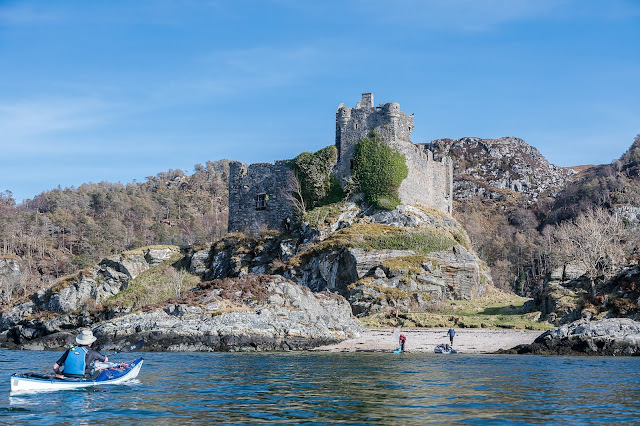 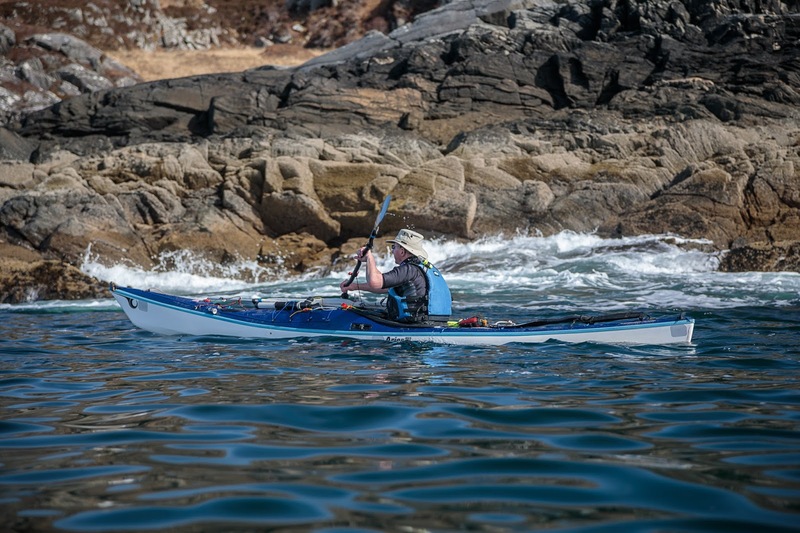 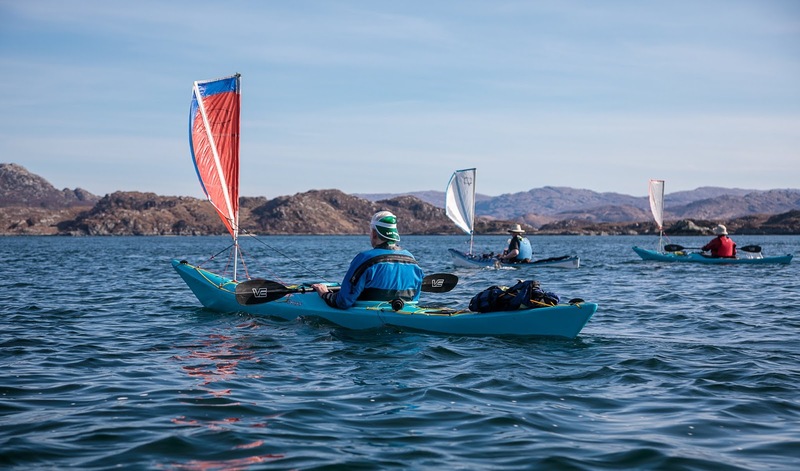 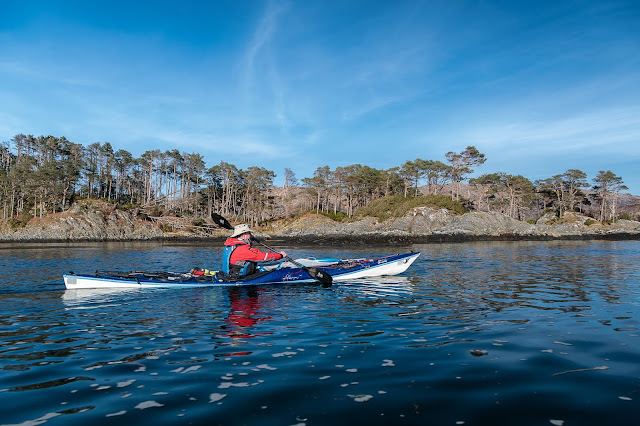 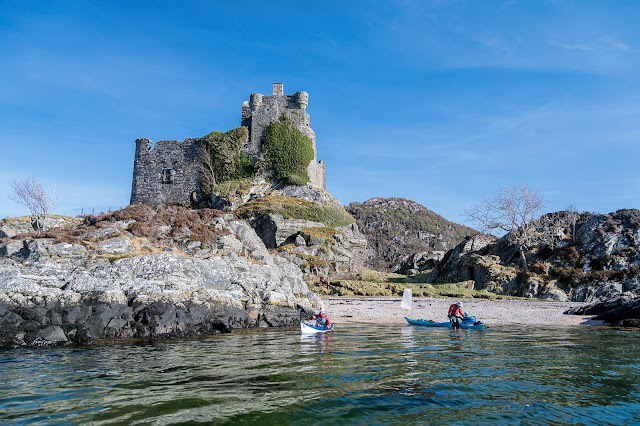 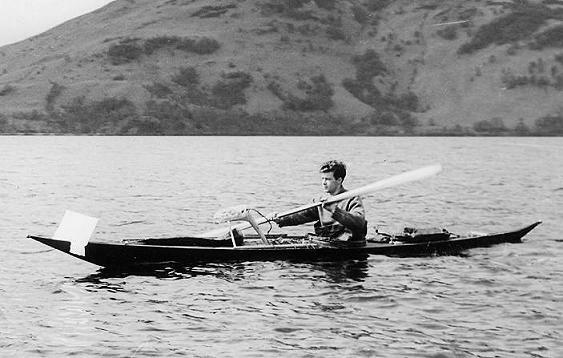 ...our exploration of the South Channel of Loch Moidart. The wooded sides of Riska island fall steeply into the blue waters of the loch. 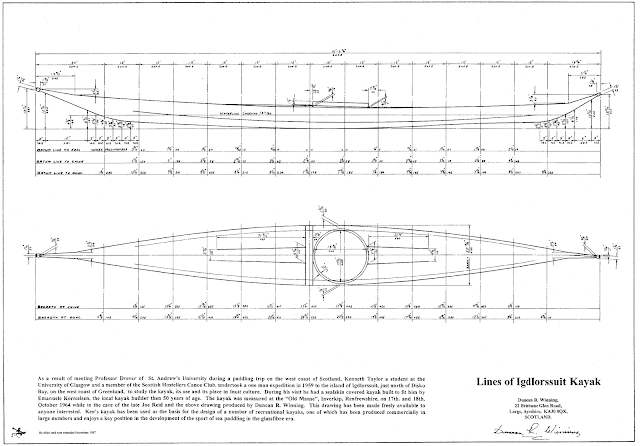 ...to fill the the North Channel. 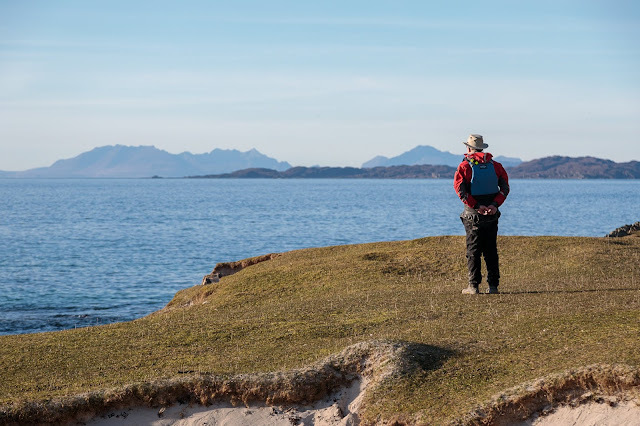 It was most pleasing to round the east end of Shona Beag and see clear water stretching away down the channel towards the Sgurr of Eigg on the distant horizon..
We passed the long abandoned hamlet of Egnaig on the north shore. Its inhabitants had abandoned their homes long before the first road came to this part of Moidart in 1966. The road arrived well before grid electricity which did not arrive in Moidart until 1988! The Sgurr of Eigg is a magnificent sight all the way down the north channel. 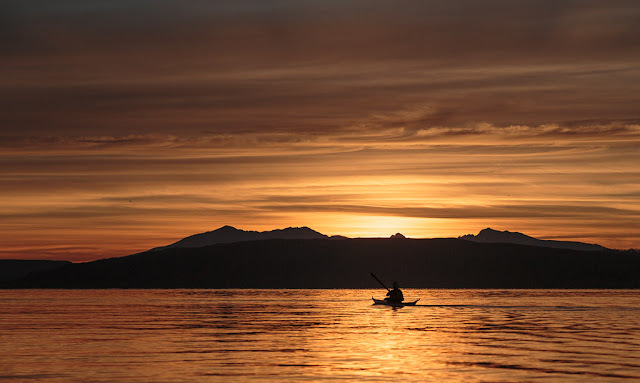 It was formed when an ancient river valley was flooded with lava from the Rum volcano. The lava cooled quickly forming very hard pitchstone. 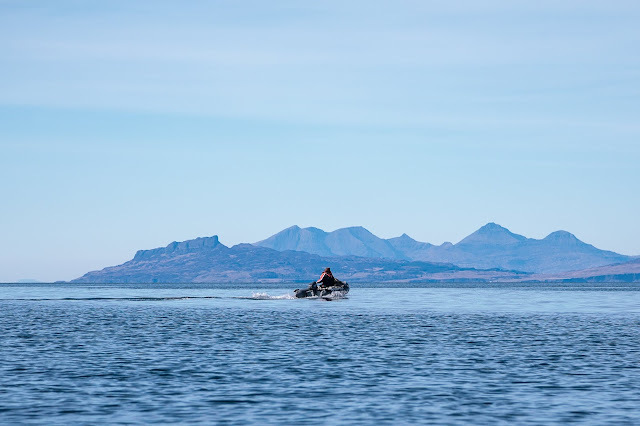 The glaciers in the Ice Age then scoured away the softer rocks that had contained the river valley, leaving the Sgurr as it is today. 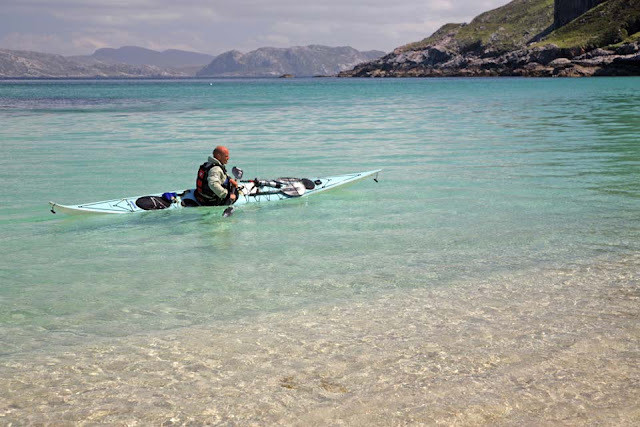 ....opens out into an area of reefs with coral sand beaches that are exposed at low tide. 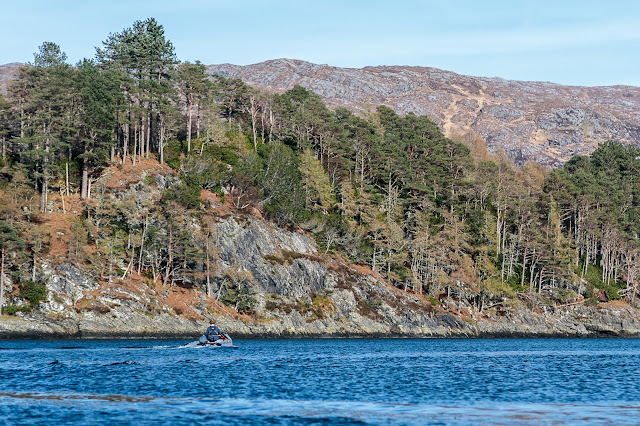 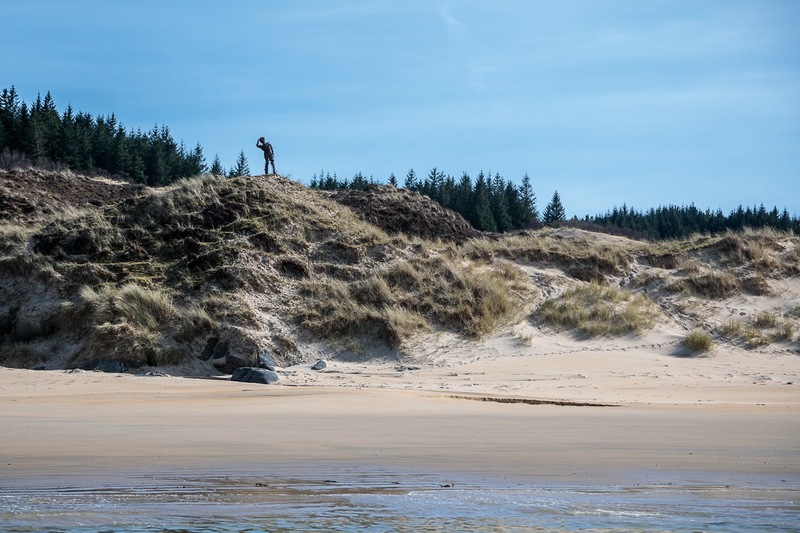 As we left Loch Moidar,t a pair of sea eagles watched us from high on these cliffs. 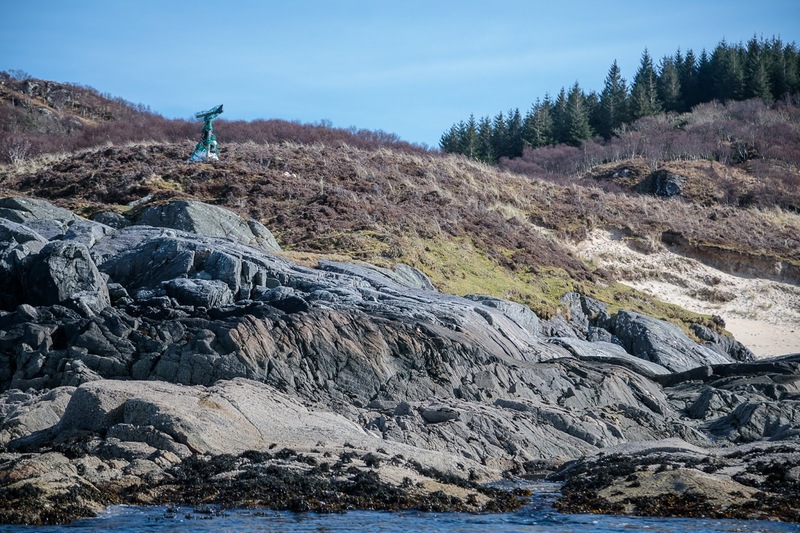 Paradise lost and found and a miserable rock at Cul na Croise (Eden). 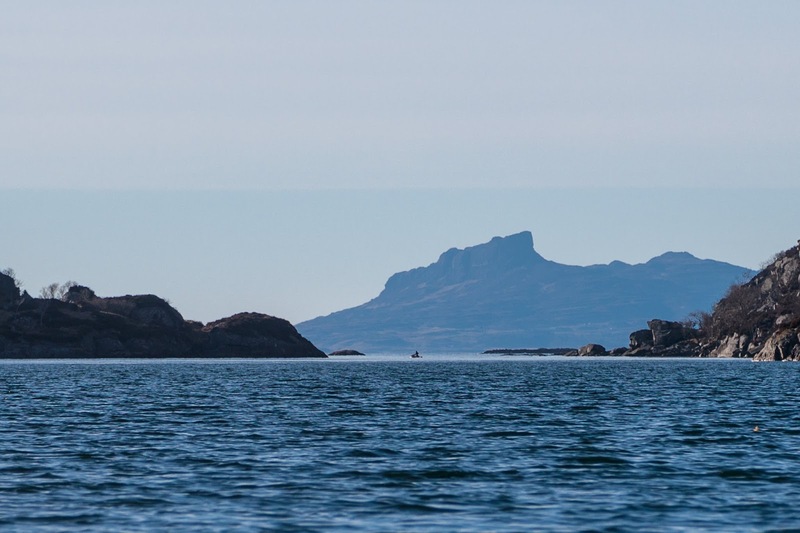 We had just set off from Camas an Leige on the north Ardnamurchan coast when Donald appeared from the west. He had very nearly made it round Ardnamurchan Point but wisely turned back due to increasing swell. 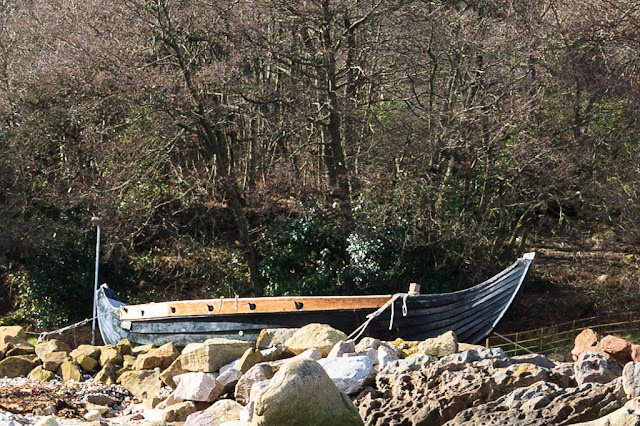 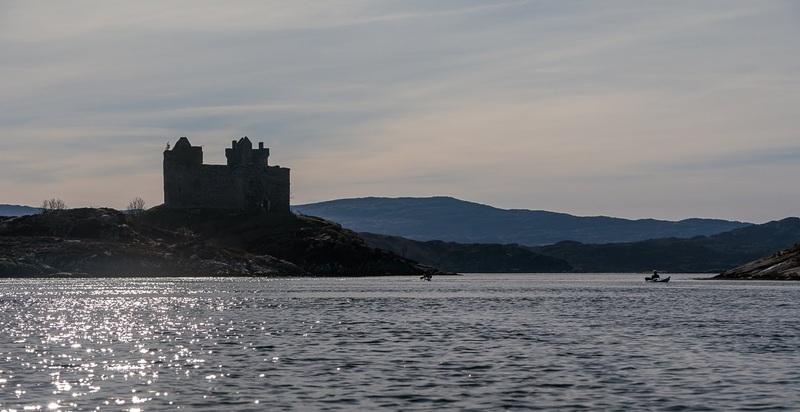 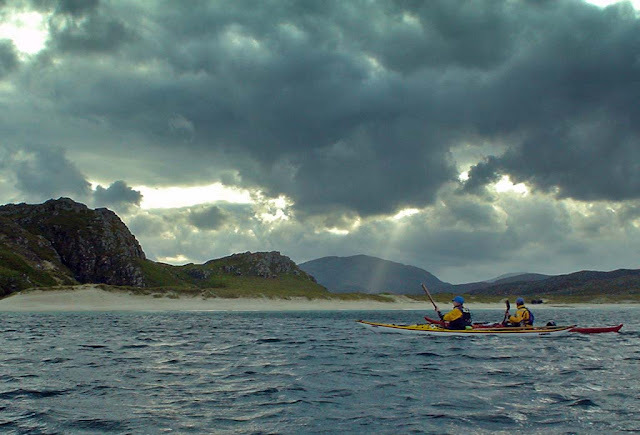 ...set off towards our next rendezvous on Eilean Shona. We set off more leisurely, enjoying the last moments on Cul na Croise. 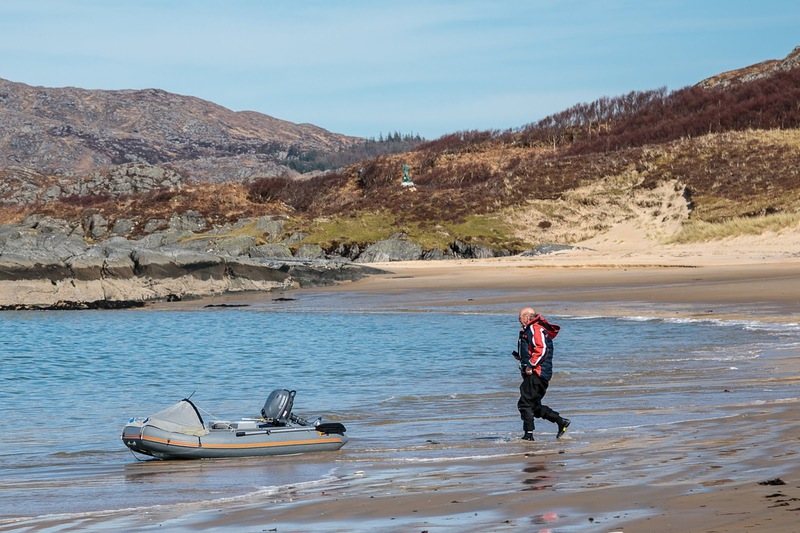 Either the swell had got up or Donald's little 6HP motor produced more wake than we were expecting. ...left behind by the participants in the Eden reality TV show. 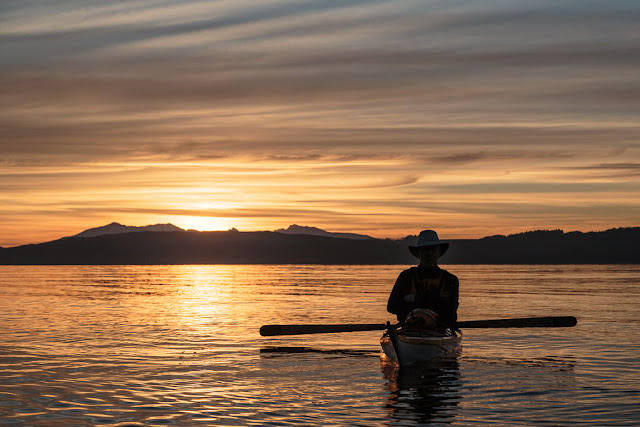 I know the participants did not find the paradise that they had been hoping to find here but what they had lost, we had found. 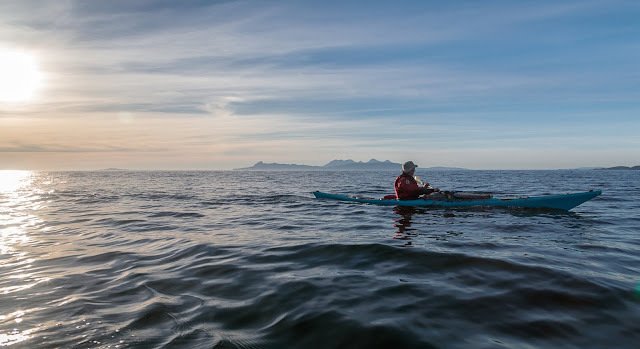 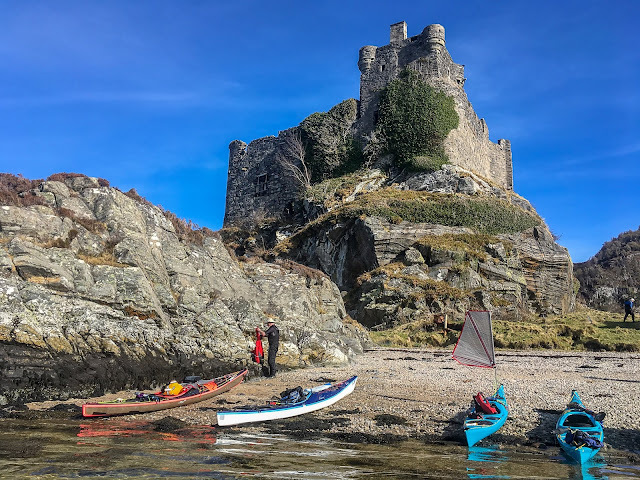 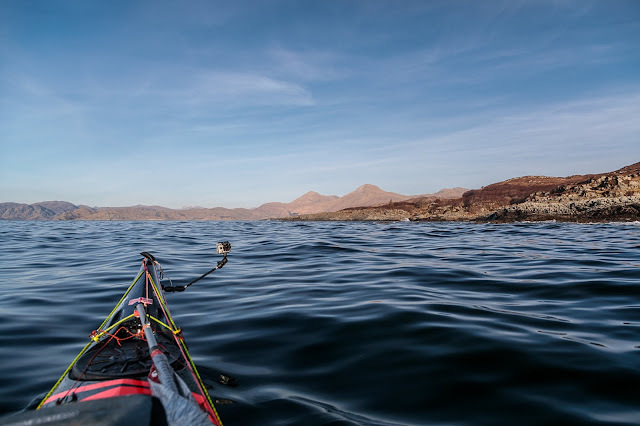 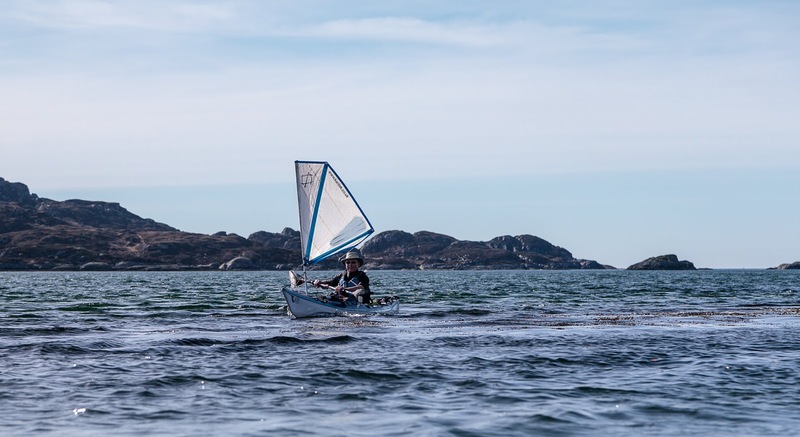 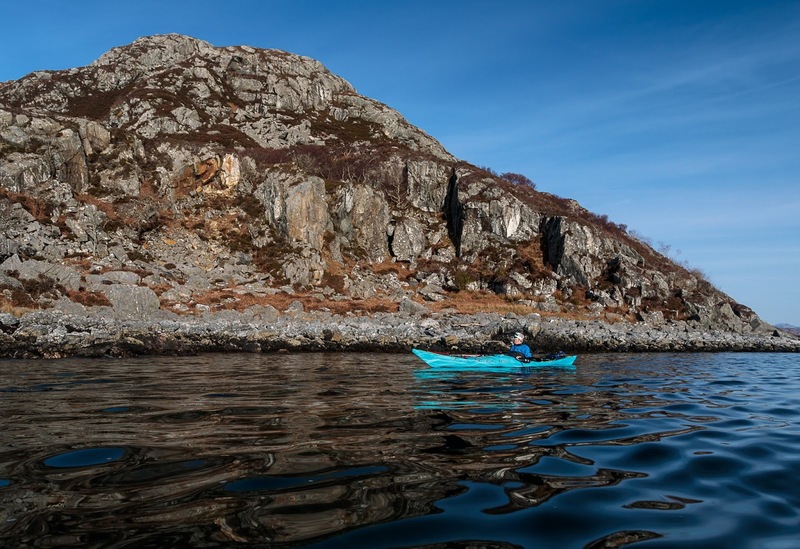 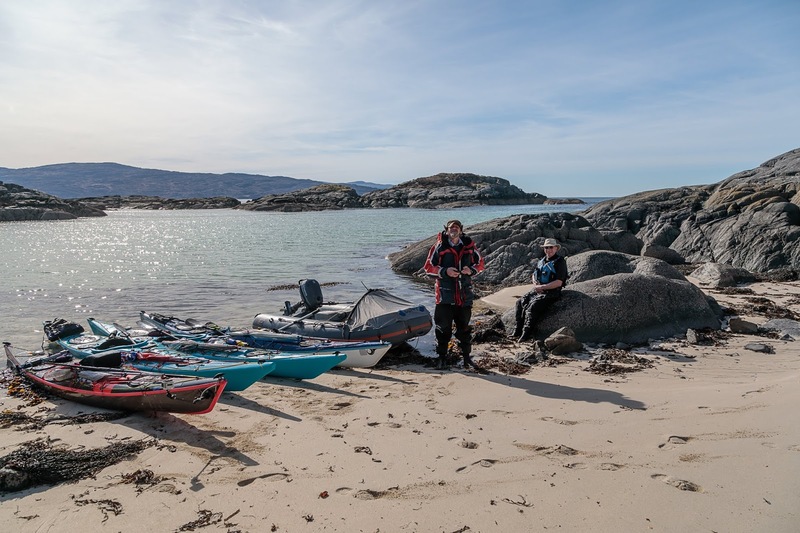 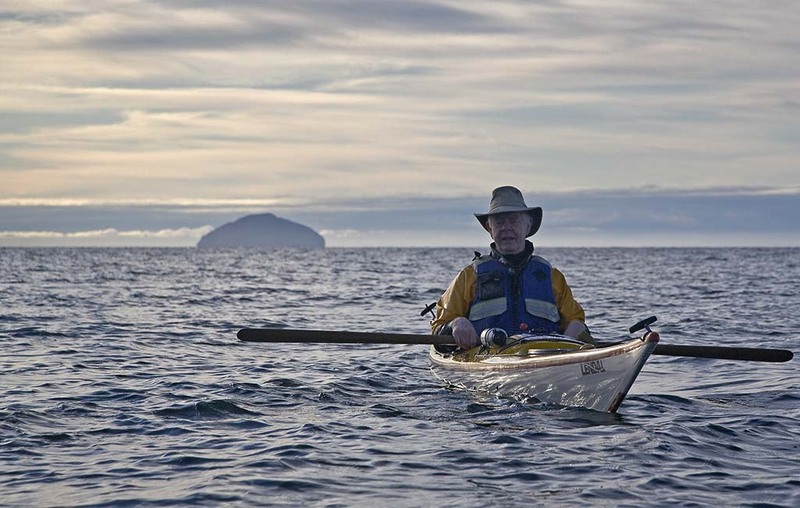 We turned our bows to the north and paddled inside the lonely islet of Sgeir an Eididh (loosely translated: miserable rock), we did not stop. 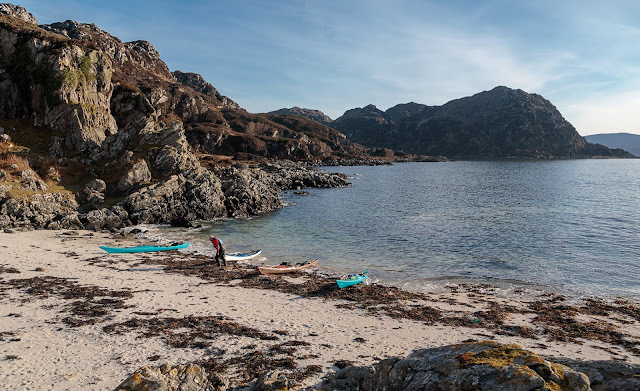 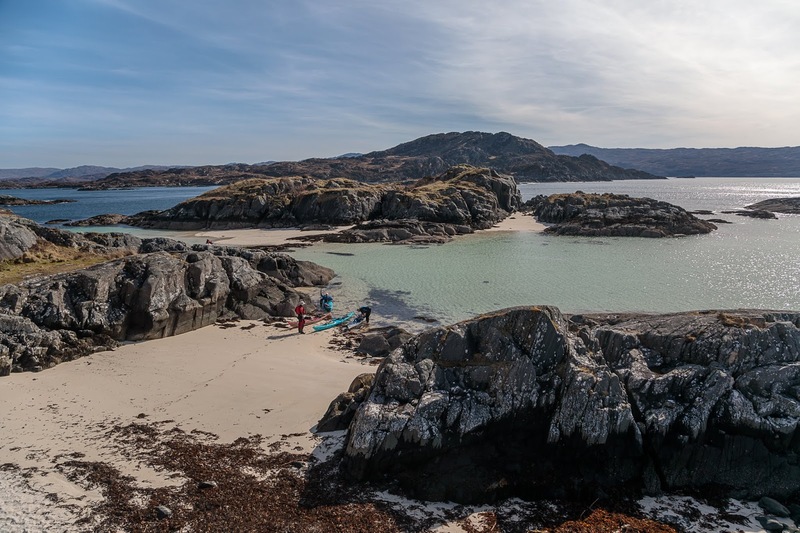 ...piece of paradise: turquoise waters leading to a dazzling shell sand beach on the north side of the South Channel of Loch Moidart.